Kenya's new railway was built with Chinese money. Could the tech sector be next target for investment? There is a general trend of decreasing foreign direct investment (FDI) in Africa. 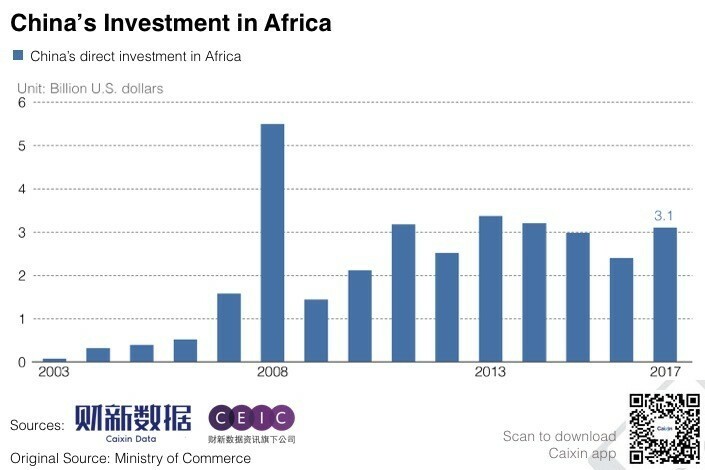 It fell by nearly 21% in 2017, and a portion of that can be attributed to a reduction in Chinese FDI on the continent. This differential is even starker considering that China emerged so quickly as a key stakeholder in Africa; China issued an estimated $94.4 billion dollars in loans to finance more than 3,000 infrastructure projects across African between 2000 and 2015. With the Forum on China-Africa Cooperation (FOCAC) coming up in September, African leaders in both the public and private sectors are holding their breath to see what President Xi will deliver. FOCAC is perceived as the most comprehensive platform for collective dialogue and cooperation between China and African countries. During the last FOCAC summit held in Johannesburg in December 2015, China pledged $60 billion to African countries, $5 billion of which came in the form of grants and interest-free loans. While there is contention about how much has actually been paid out, there have been a number of loans disbursed liberally in the past three years to finance hundreds of projects, from the Standard Gauge Railway in Kenya to hydropower projects in Angola. While it may seem worrisome that Chinese investment has slowed, many people contend that Chinese loans are still too much and too unbalanced, and that the consequences will reverberate throughout the continent. For example, China now holds 72% of Kenya’s bilateral debt, albeit Kenya’s debt to China has steadily grown over the last five years, and not just since FOCAC. However, the slowing of government loans and large-scale projects might provide a bigger opportunity for the private sector to make a sizeable impact in Sino-African relations. Because of its ambitious programme to improve intercontinental trade - the Belt and Road Initiative - the Chinese government has developed physical and digital infrastructure on which both Chinese and African companies can build. Many private sector companies, like Huawei, have already benefited enormously from Chinese public financing, but it can be intimidating for smaller companies to make their move in Africa. The expectation of Chinese firms in a number of African countries is usually one of power and wealth. Smaller companies may not be able to live up to that reputation, and this may hinder negotiations. Given China’s position as a leading and rapidly accelerating technological superpower in the world, making strides especially in the fields of logistics (smart cars, drones, e-commerce) and energy (solar panels, smart metering, etc), it makes sense that the most logical industry for the next stage of Sino-Africa collaboration is technology. While there are a number of other fast-accelerating industries, such as Chinese military hardware sales, the growth of entrepreneurship and grassroots tech innovation might lead to a more equal relationship between China and Africa. Rather than just one-sided trade, different models of collaboration such as peer-to-peer mentorship can lead to a more a nuanced and reciprocal collaborative era. While Africa may be behind China in terms of R&D and innovation, it makes up for it with a rapidly growing population and an increasingly educated middle class that will begin to demand technological advancements. Nearly 7% of the of the $100 billion dollars invested in Africa from 2000 to 2013 has been in communications, including an Ethiopian information technology infrastructure project, a Nigerian space satellite and other various projects to improve mobile coverage in rural areas. The other two areas that received the most attention were energy, and transport and storage, which received $25 billion, and $31 billion respectively. Energy generation supplies a lot of other industries, such as manufacturing, but is still a major contributor to technological advancement through its provision of stable and consistent access to electricity. Roads and distribution networks open up markets for innovations such as e-commerce, but also a more organic flow of technology transfer. Chinese entrepreneurs understand how to navigate Africa’s current explosive growth in internet literacy. While Western technology companies have made some first strides on the continent, Chinese companies may have an advantage, as their domestic market experiences often closely resembles that of Africa. In the early 2000’s, when the Chinese tech giants of Alibaba Group, Tencent and Baidu were just launching, internet penetration in China was less than 1%. With this previous experience and understanding of similar trends, combined with the infrastructural foundation provided by Belt and Road Initiative projects, Chinese entrepreneurs have a massive opportunity to collaborate with African entrepreneurs to implement Chinese technology tailored to Africa. Simultaneously, China is still a pivotal joint in the supply chain of many more traditional industries. To this end, African investors and corporations can start thinking about how to integrate closer to these manufacturing innovators. For example, Kenyan-based venture capital firm EAV recently visited China in order to collaborate more closely with the solar panel manufacturers already used by many of their portfolio companies in Africa. Africa is still a long way from integrating into the global manufacturing supply chain, particularly on a scale that China would be willing to take seriously. However, these are steps in the right direction, and we hope examples of small wins will encourage more companies to do the same. With the emergence of private sector collaboration and grassroots engagement, there is an opportunity for a more balanced dialogue between China and Africa. While it is unlikely that such private sector collaboration will re-balance the China-Africa debt ratio, it is more likely that Chinese and African tech entrepreneurs can engage as equals and generate a greater business understanding between these two regions.